The parish of Diss lies in southern Norfolk forming part of the border with neighbouring Suffolk. Diss is one of Norfolk's larger market towns, one of a number both in Norfolk and adjacent Suffolk that like the banks of the River Waveney. Diss was granted its market in the 12th century at the behest of Robert Fitzwalter and it has been an important trading location ever since. The town also became important for the weaving trade, in particular sacking and during the period of this transcript mat weaving. The town sits just west of the A140 road which connects the city of Norwich with Ipswich (Diss being some 22 miles south of the city of Norwich), it also sits on the main railway line between Norwich and London having a well-served station. The hinterland of the parish, which has been much built-over by expansion of the town, was largely an arable agricultural area albeit with pastures along the Waveney valley. A notable feature of the town is its six-acre mere which together with its well-preserved timber-framed buildings make it something of an attraction for visitors too. Modern day Diss is still a thriving market town, notably added to by commuters using the convenience of the railway to commute both to Norwich but also increasingly to London. 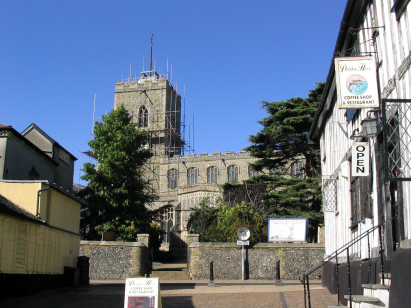 St Mary's church sits at the heart of Diss close to the main shopping streets and market. The church has its origins in the 13th century and its western tower is the main piece dating from that period albeit the framework for the wind-vane is 20th century, a replacement and apparently a copy of the original. Much else in the church dates from the grand church-building era of the Perpendicular & Decorated periods, the five-bay arcades being notable for their Decorated fenestration. The chancel was rebuilt in 1857 and the rest of the building was extensively refreshed during the Victorian era too. 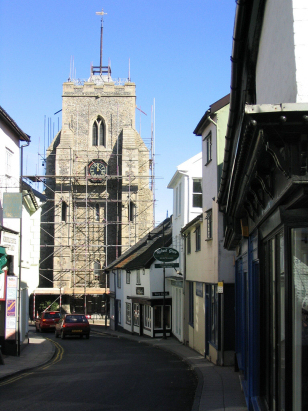 The church sits at the eastern end of the market place with its western tower flush with, indeed penetrating into, the street. North of the tower a flint wall segregated the small churchyard. The building is quite hemmed in by the town buildings and views are somewhat restricted as a result. When I visited extensive scaffolding also inhibited the views. Three standard 1600-entry register books cover the period of this transcript. The first runs from 1813 to 1835, the second from 1835 to 1859 and the third from 1860 to finish beyond the project date in 1886. The first two register are filmed on Microfilm MFRO379, the latter one on Microfiche 24 to 26 all in the collection of the Norfolk Record Office. MFRO379 is a relatively recent re-filming whilst the fiche are rather ancient and of a poor quality. The registers have suffered quite noticeably from fading so the online copy image on Familysearch were extensively used to ensure an accurate transcript. These images can be downloaded and manipulated by software to make them more readable a characteristic which was required extensively in 1st and 3rd registers. Despite the poor images it is hoped that an accurate transcript has been produced but there remains a small caveat due to the image quality.